This one looks a bit like I feel this week! Little man has found his feet, he has been toddling around for a good month or so but this week his confidence has grown and he is like Usain Bolt. One rustle of a bag or the creak of a door opening and he is off to investigate at a 100mph! So, needless to say after my millionth dash from one end of the house to the to other I am feeling a tad "vintage". For this one I started by staining an A4 piece of card using Tea Dye Distress stain. 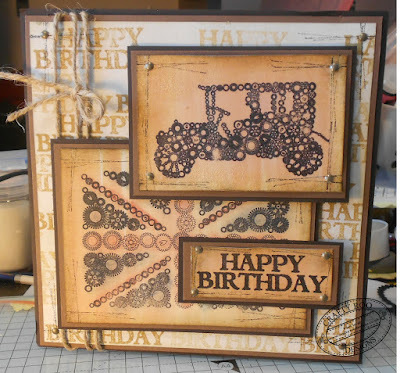 Whilst that was drying I cut a 7.5 inch square piece of card and stamped Happy Birthday all over it, using the 1st and 2nd generation images to add more texture. I then distressed it, added sketch marks, mounted it onto a brown card, added a brad to each corner, tied some string around it, then mounted it onto an 8 in square base card. When the stained card was dry (I cheated and used a heat gun to speed it up) I stamped Crafty Jack in one corner and Jalopy in the other I trimmed these down. Onto a spare piece of the card I stamped Happy Birthday and trimmed this down too. I then added some colour to Crafty Jack using distress inks and distressed all the three stamped images adding sketch marks. These were then mounted onto brown and black card as before. I then attached Crafty Jack to the card. Onto the three stamped images I added crackle glaze and left to dry. When everything was dry I punched a small hole in each corner of Jalopy and Happy Birthday, added brads and attached them to the card. This one was so much fun to make and I remembered how much fun Crackle Glaze can be!!!!!!!!! If you like our stamps, why not check out our website.